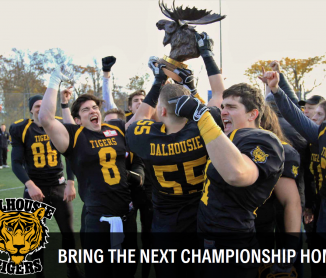 What a ride, the 6-0 Jack Irving trophy winning Dalhousie Tigers are on. And that took into consideration the wet, windy and wild bus ride to PEI which started in early Saturday morning darkness. It was somewhat of a crap shoot whether the bus would be able to traverse the Confederation Bridge but commander Wilson had alternatives just in case. But they were not needed. It was retro football as the Tigers got wet and cool in the warm up on Holland College’s natural grass field. Varying degrees of rain were experienced during the prelims but the football weather gods came through as the rain let up and on a field full of puddles, Dalhousie overcame the weather and the Hurricanes, 33-7. The Tigers were two and out on their first possession but picked up a point on a wide 31 yard field goal attempt by Rob Wilson on the second series. Next possession, QB Hunsley connected on a 49 yarder to Bernier and then a 12 yard TD toss to Chant. Wilson’s PAT was good and his deep kickoff saw the Hurricanes give up a safety a few plays later, making the score, 10-0. The second Q started with the black and gold up 10 and facing Holland College’s only real drive of the half. HC’s QB, MacKenzie, picked up a long gain on a QB sneak. A few first downs later, the Hurricanes stopped their own drive with an objectionable conduct penalty and a fumbled snap. An attempted FG would go wide and Dal would run it out. The Tigers scrimmaged first and 10 on their 5 after a holding call on the FG return. On breaking an initial tackle, Leger would bounce to the outside and sprint his way the remaining 105 yards for the TD escorted by two receivers. Wilson’s convert would make the score, 17-0. A long KO return by HC’s McRae gave the Hurricanes good field position but back to back penalties after a few first downs saw the home team give up the ball and the Tigers start this possession from their 20. QB Nick had the ball in the air on a long completion to Chant. A HC pass interference call led to a 42 yard TD from Hunsley to Bernier. The simple slant pattern saw “G”s speed distance the defenders for the 6. Wilson’s PAT hit the upright making the score 23-0 at the half. Dalhousie’s second possession in the 2nd half produced very quick results as Hunsley’s back to back sideline completions to Spencer Muise resulted in a 21 yard TD. The black and gold O line should be applauded for pass blocking as Hunsley, often in an empty set was hardly hurried. Wilson’s convert was good and a HC UR allowed Wilson to kick off from the HC producing a single. Tigers 31 – Hurricanes 0. Dalhousie’s D, playing their usually shutout D, saw a fake punt by Liam Carter turn into a 70 yard gain leaving the Hurricanes on Dal’s 5. Van Bodden would score on a 5 yard run, making the score, 31-6, as the PAT was missed. HC’s short kick off was secured by Bernier but a few incompletions and a penalty stalled the O. Wilson’s coffin corner punt went out on the Hurricane’s one! Holland eventually gave up a safety but a UR on Dal gave HC a favourable KO which produced a single, making the score board read, Tigers 33 – Hurricanes 7, at the end of 3. The Tiger O with some substitutes was ineffective in the 4th Q, while the Tiger’s vaunted D led by interceptions from Kenzie MacNeil and Wilson terminated Holland’s short drives. The black and gold’s hit parade was led by: Matt McKenney with 9, Jack Chaisson 8, Jesse Legault and Liam Manson 6 and Connor Manson with 5. What a ride continued on the way home as double rainbows were enjoyed by the winning but tired Tigers. The 6-0 may have been duplicated but the 242 points for and especially the 22 against are probably new standards for a 6 game AFL regular season. The ride will not get any easier for the Tigers with the playoffs, but being at home has benefits! Two weeks of drive, hard work, focus and poise could culminate in the football ride(drive) of a lifetime! An AFL title and an unforgettable Year of the Tiger.